The Thermo Scientific Pycnomatic is the ultimate development for density measurement of solid materials available. 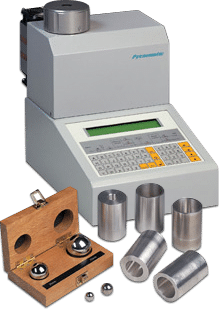 Based on the technique of gas displacement to measure real density of solids and powders, Pycnomatic delivers unrivalled fast and accurate results. Real density is a fundamental parameter required to complete the characterisation of many solid materials and powders. In addition, density analysis by gas displacement technique is a rapid and reliable way to determine the purity of solids, whenever an immediate but precise test is required. This applies to a wide array of technological fields such as: ceramics, mineralogy, geology, pharmaceuticals, metallurgy, pigments, building materials, foams, plastics, polymers, abrasives and catalysts, just to name the most important.